Born in 1992, ob is the most important of the many artists who emerged as part of Japan’s SNS generation in 2010. As a university student in Kyoto, she organized and curated several local exhibitions after reaching out to other artists her age through the illustration communication service pixiv. 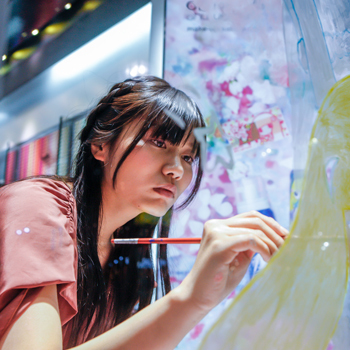 This culminated in the exhibition “Wassyoi” for which she received much attention and acclaim. The name “Wassyoi” itself stems from the chant used by revelers in Japanese street festivals. As part of the new generation of artists who grew up in an environment where video games and social media have always been part of daily life, she explores the dreamy filter of the feminine psyche through the recurring motif of a wide-eyed young girl in her delicate, atmospheric paintings. ob collaborated with renowned cosmectics line shu uemura in 2013 and has been featured numerous times in art fairs overseas.